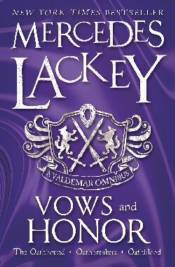 This omnibus collects Marcedes Lackey�s bestselling and much loved fourth series of Valdemar novels: The Oathbound, Oathbreakers and Oathblood. This series follows the adventures of Tarma and Kethry. Tarma is a member of the nomadic Shin�a�in people, who saw her people slain by barbarians. The sole survivor of a raiders' killing spree, Tarma shena Tale'sedrin becomes a Swordsworn warrior-priestess of the Goddess and vows to found a new Clan Tale'sedrin someday. She is helped in her quest by Kethry, who fled an abusive past to master her magical talent as a White Winds mage. Together Tarma and Kethry are bound by Kethry's sword to come to the aid of any woman in danger. As they go on missions of mercy and perform mercenary deeds to survive, the blood-sisters attempt to re-found the clan.